CEI Research Assistant Eric Schneider releases a tagged fish that has fully recovered from the surgical procedure. Bonefish are not the only economically important species found on the flats! Bonnethead, lemon, blacktip (pictured), and other sharks all visit shallow nearshore habitiat and were spotted while seining for bonefish. Bonefish are a highly sought-after sportfish, supporting a $140+ million industry in the Bahamas. Shallow coastal waters that bonefish inhabit are under threat from development and other human-induced stressors; identifying how bonefish use critical foraging and spawning habitats is essential for securing the longevity of the Bahama’s bonefish fishery. 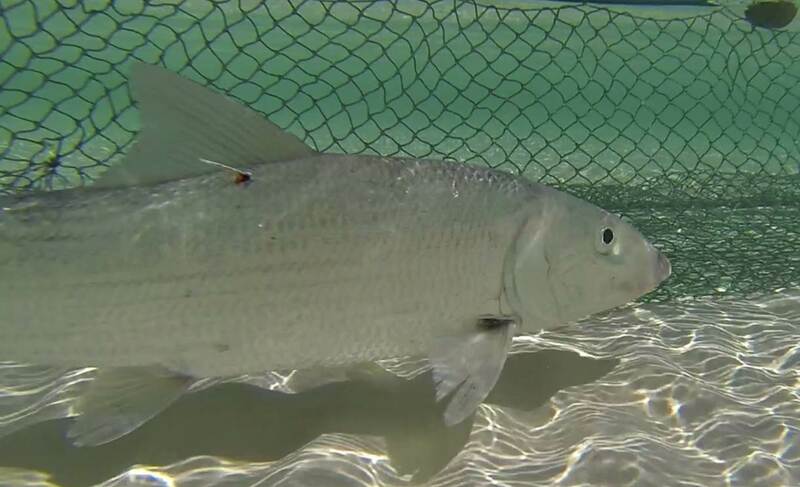 Over the past week, CEI’s Flats Ecology and Conservation Program (FECP) has been conducting a field study on Grand Bahama Island as part of a joint effort to further investigate the spawning activities of bonefish. The FECP is joined by a diverse team of scientists, fishermen and stakeholders that hope to learn more about local populations to direct future conservation efforts. The overall objective of this multi-year study is to determine the location of bonefish spawning aggregations to best determine possible sites for the establishment of Marine Protected Areas and National Park’s to conserve the local bonefish population. 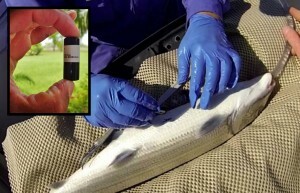 Fig 1: An acoustic transmitter (inset) is inserted into a bonefish via a small incision on the fish’s underside. A hose supplies water to the fish’s gills throughout the duration of the brief (~2 minutes) procedure. Fish recover fully after only a few minutes. Fig. 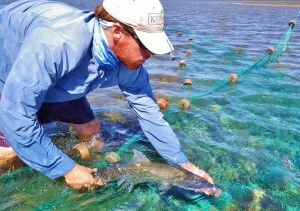 2: Bonefish are corralled in a seine net – a method of capture that is safe for the fish. Seine nets double as a recovery pen after surgery, too, as pictured here. 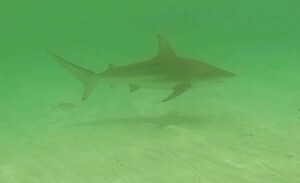 Notice the external tag that will allow future anglers or scientists to identify this fish as having been captured on Grand Bahama. Fig. 3: Location of acoustic receivers (inset image) deployed around Grand Bahama. Bonefish typically inhabit shallow flats, but migrate as large schools to deep water during spawning events. The location of the acoustic receivers (balloons) will allow the fish to be tracked as they migrate through shallow habitat en route to spawning aggregations. Stars denote location of bonefish capture/tagging. To accomplish this, the team deployed 32 VEMCO acoustic receivers – devices that can record the signal from acoustic transmitters – and surgically implanted 56 bonefish with acoustic transmitter tags (Fig. 1). 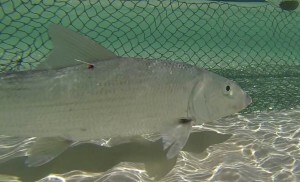 Bonefish are captured by seine netting or angling (Fig. 2), carefully anesthetized prior to surgical implantation of a small battery-sized transmitter tag, sutured, and then allowed to recover before being released. Once released, the fish can be tracked when it swims within 1 km of any of the submerged receivers (Fig. 3). CEI Director Aaron Shultz, along with CEI Research Assistant Eric Schneider, Research Technician Nick Balfour, researcher Malcolm Goodman, and CEIS board member, Dr. David Philipp of the Fisheries Conservation Foundation (FCF) led the group from Eleuthera. Greg Vincent and Jason Franklin, Co-owners of h2o Bonefishing, also add to the team from Grand Bahama with Justin Lewis, a former CEI Research Assistant, who is coordinating the assistance of the Bonefish and Tarpon Trust (BTT) and the FCF within the Bahamas Initiative. Lending further expertise and knowledge of the area is Dr. Karen Murchie, an Assistant Professor at the College of the Bahamas, Dr. Aaron Adams, the Director of Operations at BTT, Paul Adams, Manager of North Riding Point Club, a bonefishing lodge on Grand Bahama, and Eric Carey, Executive Director of the Bahamas National Trust (BNT). Stay tuned for further updates from Grand Bahama Island.